Hi, my name is Jill Papin. 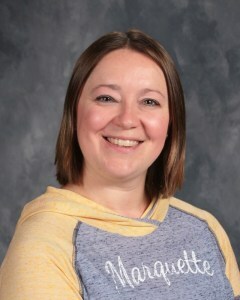 I teach 3rd grade here at Marquette. I've taught 3rd grade for the last several years, but I have also taught 1st grade here at MCS. However, my journey at MCS didn't start as a teacher - I was a student here also! I am married to Sam Papin, and I have two daughters: Addison, age 7 and Julia, age 4. They will be in 2nd grade and preschool this year. I also have a 10-year-old golden retriever named Laine. I grew up in Virginia, but I attended college at Bemidji State University (BSU), and I have also lived in International Falls for awhile. My degree from BSU is early childhood education.My hobbies include painting and doing fun things with my family.